Today is the International University Sports Day and four tertiary institutions in Port Moresby had some of their students out at The Taurama Aquatic and Sporting Centre to participate in sports organized by the High Performance Unit. 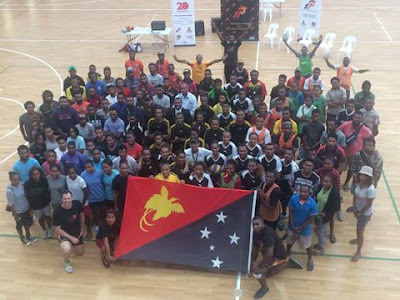 The University of Papua New Guinea (UPNG), Institute of Business Studies (IBS), International Training Institute (ITI) and Don Bosco Technical College (DBTI) are all taking part in Basketball, Rugby Touch and Volleyball to celebrate this day. A representative of the High Performance Unit in speaking to the students, highlighted the significance of the day. “Today all over the world over 250 countries will have their universities celebrate this game”, he said. “ We organized this to give an opportunity to you Uni students to participate along with other countries because there is a so called ‘World University Games’ that takes place out there and we believe down the line maybe PNG can have a team of smart and competitive university students who will be invited to take part”. The celebrations will end at 4pm this afternoon with winning teams announced. The games were held also so that the students could interact and get to know each other.